After watching me fiddle with the panorama function on my camera for a few seconds, Jon mocked the quality of such shots. I’d like to think the little camera got the last laugh. This was the view from just above our base camp for the weekend. We had hiked around 7.5 miles on the approach on the South Colony Lakes trailhead road which is now closed to all motor vehicles and even more inaccessible due to deep snow. The gently sloped approach wouldn’t normally cause a headache, but with all the gear we brought for the weekend, our packs were pushing 50-60 lbs and weighed us down. After setting up a tent and dropping most of our unnecessary gear, we set our sights on Humboldt Peak rising to the north. There was a snowfield running half the length to the summit so we packed our skis/board hoping to make it to the summit before nightfall. The slog of hauling our heavy packs all day was beginning to wear us down and our legs worked to get up the slope. After a few hours of slow climbing, we finally reached the summit with a little sunlight to spare. We carefully picked our route down in the alpenglow and got on the snowfield just as the sun had set behind the skyline. Some Italian sausages, bell peppers and onions were a welcome dinner at that point. We also had to boil some water from snow around camp to toss in our sleeping bags for the morning trek. Neither of us slept a whole lot with the 10 degree cold and howling winds nagging us through the night. Still exhausted, we woke up at around 7 am and made way towards Broken Hand Pass. It was a gorgeous day but things didn’t go our way for most of the morning. Jon’s helmet fell off his pack sometime before reaching the uphill snow climb and half way up one of my nalgenes slipped out of my pack and slid a couple hundred feet down below. We didn’t let a couple setbacks get us down, but instead, pushed forward to the top of the pass. From here we could see the Needle rising from the ridge above us and some spectacular lines off the peak just to the south. Beyond those, the San Luis valley sprawled out for as far as the eye could see. The Sangres are unique in that they practically jut out from a valley floor on both sides and offer some cool views of the valley below. From the top of Broken Hand Pass, we descended west underneath the Needle towards Crestone Peak where we started up the Red Gully. By this point in the weekend, we had already climbed nearly 6,500 vertical feet and our legs were beginning to break down. The lack of water (after slipping out of my pack) and little sleep we got the night before weren’t helping either. After ascending a little more than half of Crestone Peak, we decided to call it a day and turn back. Our plan was just too ambitious. Without some wandering through deep snow in the basin the day before, or taking an unmarked route up Humboldt, we may have had the extra energy needed to succeed but it just wasn’t in the cards for this trip. After collecting some snow melt for water, we down-climbed a mixed section of the gully before strapping up and riding down to the basin floor. The snow here was solid and wind-blown to the point where turns weren’t made out of habit but more out of necessity. Chopping our way down wasn’t the highlight of the day, but we felt somewhat accomplished for making it this far. We packed up our gear at the bottom and hiked back over towards the pass. It seemed much less menacing on the way back as it did that morning. I think I knew in the back of my head that this couloir was waiting for us with good snow protected from the sun. We dropped into sheer bliss down the north slopes of the pass with powdery conditions. After a couple high-fives and a sigh of relief, we took in the beauty of the lake below and called it a day. Thank god our last descent gave us a little pick-me-up after all the hard work we had done for such crappy conditions. We left the Sangres shooting 1-3 in summit attempts but felt good to get outside for a couple days to enjoy the mountains. I sometimes question whether trips like this one are worth it, but the mountains always find ways to reward your hard work. Next time, a little extra planning and some more efficient route finding would have saved our energy along with our goal of a couple more summits. As always, just happy to make it home safe and have had a fun weekend. Rocky Mountain National Park has some of the most aesthetic lines I have ever seen. After being introduced to the Terrain Park last year, I’ve loved exploring the park a little further for more lines. Dragon’s Tail is by far the coolest one. Jon and I had a beer and a burrito on Friday night and discussed a couple options until we landed on the Dragon’s Tail and it was a no-brainer. Zach offered to drive and picked Jon and I up the next morning for a late start. We were on the trailhead headed up to the top of Flattop by 9 am. After a quick steep scramble on the other side of Bear Lake, we hooked up with the main skin track that was a well-established route straight to the top. Just below the summit, the looker’s left side of the Y at the top of the Dragon’s Tail dropped away from the summit ridge. We strapped in around noon and were relieved and surprised to see the entrance to the couloir wasn’t a 20 ft drop and the line continued without interruption through an apron onto Emerald Lake below. After snapping a few shots of Longs Peak in the background, I was the first to drop in the upper bowl. The snow felt stable after the first couple turns and I got a bit more aggressive before finding a safe spot to give the go ahead to Zach and Jon above. We all ripped down the couloir one at a time next to the nearly 1,000 ft rock wall that towered over our right shoulders. Some slushy turns down by the lake and a couple high fives wrapped up an awesome day. I’ll definitely be back for round two sometime down the road. Dragon's Tail Couloir from Tyler Grubb on Vimeo. After missing a trip last weekend to the Silver Couloir on Buffalo Peak with Jon and Collin (Jon's Post), I managed to wake up at 4:30 AM to drive up to the Quandary Peak trailhead to tackle the Cristo Couloir. 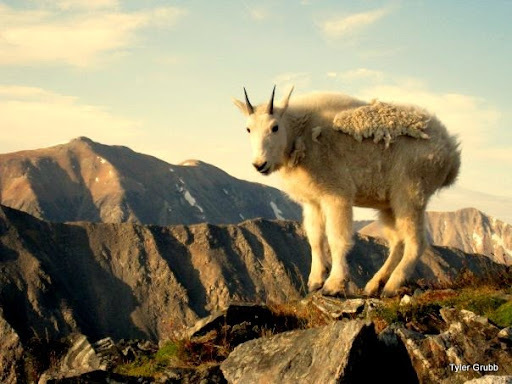 I had climbed Quandary in the summer a couple years back and got some sweet shots of mountain goats hanging out in the summer sun. Today wouldn't be quite as nice weather wise. The 60 mph wind gusts on the summit ridge made the last 500 vertical feet of climbing pretty strenuous, especially with my board acting as a sail on my back. I managed to summit a couple of minutes behind Jon and Collin and got a quick bite to eat before we dropped into the couloir. The snow was soft and wind loaded so we took a cautious route down with stopping in safe zones for the first half of the descent. After this it mellowed out quite a bit and we rode through the run-out onto a frozen lake. A couple PBRs back at the car rounded out an awesome morning. Cristo Couloir from Tyler Grubb on Vimeo.